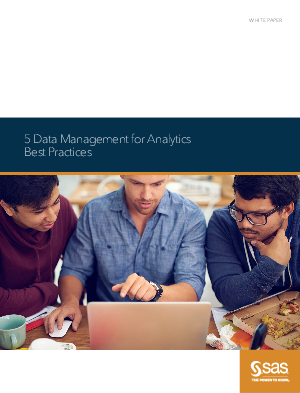 For data scientists and business analysts who prepare data for analytics, data management technology from SAS acts like a data filter – providing a single platform that lets them access, cleanse, transform and structure data for any analytical purpose. As it removes the drudgery of routine data preparation, it reveals sparkling clean data and adds value along the way. And that can lead to higher productivity, better decisions and greater agility. • Simplify access to traditional and emerging data. • Strengthen the data scientist’s arsenal with advanced analytics techniques. • Scrub data to build quality into existing processes. • Shape data using flexible manipulation techniques. • Share metadata across data management and analytics domains.